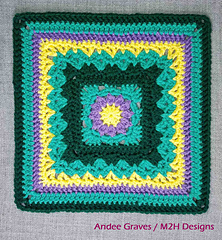 Another in my birthday series of Afghan squares, this time we are getting a bit floral with lots of visual texture. This is an entertaining block with 9 color changes. I used only 4 colors, but you can use 2-9 if you want. 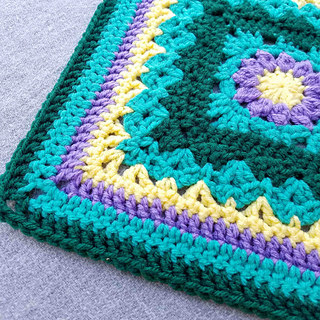 The yardage requirements for each of my 4 colors and the yardage for each color change are detailed in the pattern. Gauge numbers are the final stitch count at the end of Round 4. You should have a 4 inch square at that point.